A pain relieving lotion comprising Magnesium in a 99% natural lotion base. Magnesium is the fourth most abundant mineral in the body, and plays a role in over 300 essential metabolic reactions. Needless to say, a deficiency in this essential nutrient is going to leave you feeling out of sorts, and can pave the way for more serious health issues down the road. A simple way to increase magnesium levels is by applying a magnesium rich lotion, such as Life Leader MagNoPain, to your skin daily. In addition to boosting levels of this nutrient, this luxurious lotion also softens and moisturizes your skin! Can improve vital calcium absorption. As you can appreciate, applying magnesium to the skin is a fantastic way to complement your dietary intake. And with 250mg Bioavailable magnesium per teaspoon contained in Life Leader MagNoPain this should be easily achieved. In a study done in the UK, it was seen that, in just 12 weeks, 89% of subjects raised their cellular magnesium levels and improved their calcium/magnesium ratio using topical magnesium. This is excellent considering that equivalent results using oral supplements can take between 9 and 24 months to achieve! 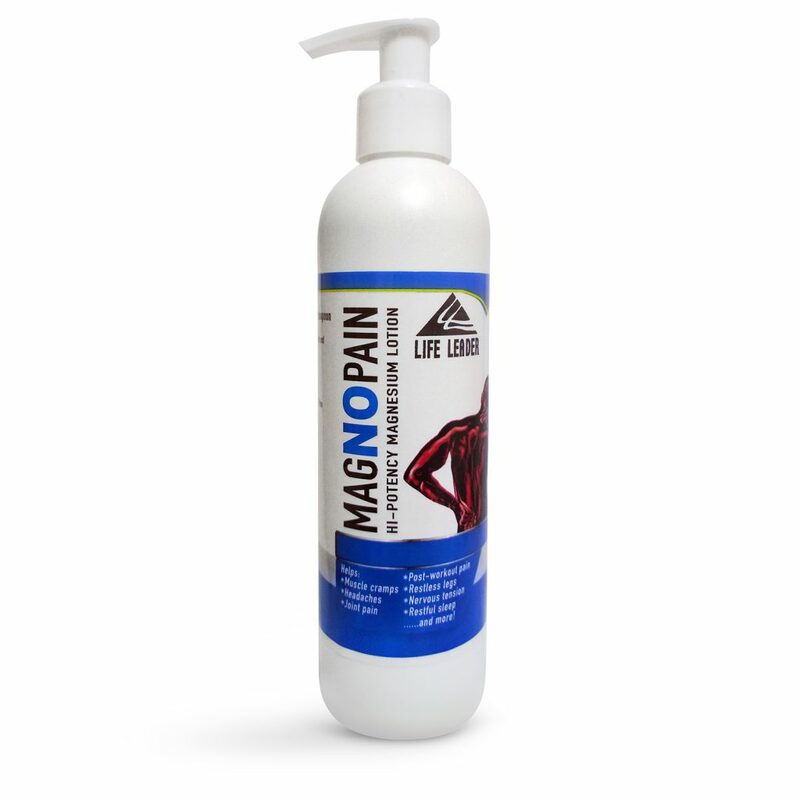 Why try Life Leader MagNoPain magnesium lotion? Those with aches and pains caused by inflammation, tension, stress, sore joints, arthritis and post workout soreness should give MagNoPain a try. It’s the most efficient way to deliver magnesium to the site of the pain so that it can give rapid relief because it doesn’t need to pass through the gastrointestinal tract. Further, it can reduce cramps, get rid of a headache, encourage regeneration of tissue and fight tiredness. Regular application may even increase flexibility and endurance. The type of magnesium found in Life Leader MagNoPain is magnesium chloride. This form of magnesium is highly absorbable and is used in medicine. One teaspoon will give you 250mg bioavailable magnesium! Simply apply to any part of the body where you require some pain relief or relaxation. Depending on the natural magnesium levels you have, it may take anywhere from 20min to 2 hours to feel the full effects. Regular use raises the magnesium levels and the results should come faster. Apply before bed for a restful sleep! PRECAUTIONS: DO NOT USE IF YOU HAVE KIDNEY PROBLEMS OR DIGESTIVE PROBLEMS (SUCH AS IRRITABLE BOWEL SYNDROME). CHECK FIRST WITH YOUR DOCTOR IF YOU’RE PREGNANT OR BREASTFEEDING. DO NOT USE IF ALLERGIC TO ANY OF THE INGREDIENTS OR ESSENTIAL OILS. DO NOT USE AROUND THE EYE AREA. Made from 99% natural ingredients from plant and botanic extracts, free of parabens, petrochemicals and SLS’s. Non-comodogenic (will not block pores) so magnesium can be completely absorbed through your skin. ← Alkaline Water Benefits – Can the Claims Be Proved?